What Persepolis did to bring the revolution in Iran to the attention of youth culture, Dalia Sofer’s The Septembers of Shiraz takes one step further. In this novel, we follow the lives of a single family caught in the heart of the revolution. Isaac Amin is arrested in a warrentless land, on no charges other than mere suspicions and paranoia through his loose relations with the former Upper Class powers that were (The Shah). During this arrest, the rest of his family struggles to make some sense of the upheavel that has taken place in their lives. Unrest is a constant theme in this novel, as is identity (or lack thereof). Sofer’s unique take on the novel gives the reader a different perspective in each chapter. We learn through the eyes and ears of Isaac, his wife Farnaz, their daughter and son. There is a strong emotional tie that connects each family member. Even though the son, Parvis, is living in New York, he struggles with his family to understand his place in the world. My favorite chapters were told through Isaac’s daughter, Shirin. Her young perceptive eyes tell a story in a direct and simplistic way that only a child could tell. We see the family fall apart, but somehow manage to stay together at the same time. For me, it was weird reading this book, since it all took place in the same city/country were my family was living. The story takes place from September 1981 to September 1982, two years before I was born, although you can believe me when I say that the book does not exaggerate the desperation and struggles each and every characters goes through in this novel. Its a very insightful look into humanity and its will to survive. Dalia Sofer is going to be speaking at a local bookstore in the Bay Area this week, see schedule at the bottom of the post. I plan to go tomorrow night, and hopefully will be able to update with some more insights into this novel after hearing her speak. 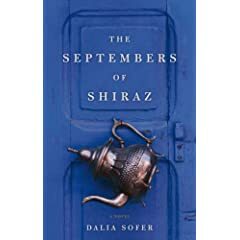 This entry was posted in Adult Fiction, Books and tagged Dalia Sofer, Iran, Iranian Revolution, The Septembers of Shiraz. Bookmark the permalink. Ooh, be sure to blog about how the reading goes. I’ve got this book on my wishlist and am dying to hear more!